Cable and connectivity is the unsung hero or our industry. There are very few products, if any, that do not need to be connected to something else via wire or cable. That being said, the sale and use of low-grade counterfeit cabling is a growing issue that poses a problem too large to ignore. At the very least, the use of counterfeit cables on a project will cause a customer’s network to operate below standard. At the worst, an installer who, knowingly or unknowingly, uses low grade cable which causes a fire could face civil liabilities and monetary damages just to start. With this problem taking up a significant amount of space within our industry we would like to share some points with you that you should know when it comes to cable. Counterfeit cables are sold under false pretenses and are purposely meant to deceive. Counterfeit cable is almost always marked and advertised as being compliant to fire codes, TIA specifications and UL safety standards but isn’t. Instead these cables are primarily substandard, non-compliant and very cheaply made. What are the Risks of Using Counterfeit Cable? To begin with, counterfeit cable and connectivity will fall well under industry performance and construction standards. This can cause poor network performance and potential damage to equipment due to poor construction. However, if these are the only problems you face as a result of using counterfeit wire on a project, you got off easy. In order to earn the listings from associations such as UL and ETL, genuine certified cable must pass a series of stringent fire safety tests. These tests are meant to reduce the spread of heavy smoke and fire that could prevent a safe evacuation during an electrical fire. Counterfeit cable sellers are known for simply marking highly combustible cables that are made from lower fire performance materials with a brand name, UL Number or ETL Logo. In the case of a fire, these poorly made cables produce more heat and a thicker smoke which could potentially prevent a safe evacuation and even cost lives. Is that a risk you are willing to take? How can you check to be sure that a cable product is the genuine product? First and foremost, if you are unsure about the authenticity of cable, check the price tag. If you find 1000 feet of bulk cable on the internet priced significantly lower than you would expect, the chances are the cable is counterfeit. One way that unscrupulous cable vendors will try to save money is to sell UTP (Cat5e/6) with undersized conductors. If you suspect a problem with a cable, a good way to test it is to strip off the jacket and measure the diameter of the conductors to be sure. You should also be sure to test links and channels to be sure the copper in the cable has not been shaved down. Often counterfeit cable will be made with copper clad steel or aluminum rather than pure copper conductors. Steel and aluminum are cheaper than copper so often counterfeit cable sellers will use these “cladded” conductors to reduce cost. Copper Clad Aluminum (CCA) cables are much less flexible and more brittle which could lead to breakage. CCA cable also has a 55% greater dc resistance which causes increased heating of the cable and makes it unfit for PoE applications. 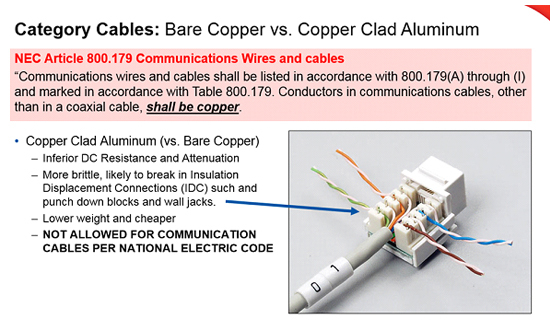 Most importantly, The National Electric Code (NEC) forbids the use of wire that is not pure copper for communications. To determine if you are holding a fraudulent cable simply cut the conductors and take a close look to see if the conductor is truly pure copper all the way through. In any case if a cable doesn’t have pure copper conductors then performance will suffer. There have been instances where male RJ-45 jacks that failed initial testing have been ground up and remolded into new jacks. These are not only inferior in performance but they are also known to fail combustion testing. If the jacks are suspect, take a good look at the jack body. If the body is not clear but has yellow or other discoloration the jack may have been remanufactured. Some vendors will supply a proper sample when it is requested by a contractor. This “Golden Sample” will not be of the same construction as the rolls of cable that are subsequently shipped. When purchasing wire in bulk, be sure to test the entire shipment to be sure you haven’t been tricked. 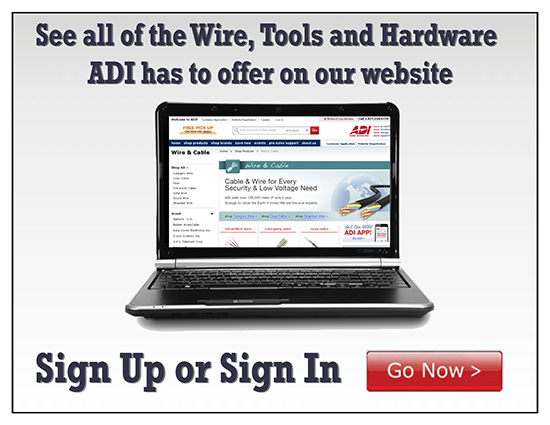 As the industry’s leading wire distributor, ADI sells over 109,000 miles a wire a year, enough to circle the Earth four times. As customer satisfaction is ADI’s highest priority, we are committed to providing a wide selection of cable products that meet customer expectations.